Canada is a vast and beautiful country, occupying the entire northern portion of the North American continent, and one of the greatest places to visit on the planet. The nation, which consists of 10 provinces and three territories, extends from the Atlantic Ocean in the east to the Pacific Ocean in the west and northward into the rarely-traveled Arctic Circle. With nearly 10 million square kilometers of land space, Canada is the world’s second-largest country (after Russia) by total area, and the southern border it shares with its lone neighbor, the United States, is the world’s longest land border shared by the same two countries. Like its southern neighbor, Canada is a melting pot of different cultures, ethnicities, customs and traditions; a place where people of all types of cultural backgrounds live and work together in relative harmony. Canada has a well-developed transportation system which includes nearly 650,000 miles of roads, ten international airports, 300 smaller airports, 44,797 miles of functioning railway track, and more than 300 commercial ports and harbors that provide access to the Pacific, Atlantic and Arctic oceans as well as the Great Lakes and the St. Lawrence Seaway. Last year, the transportation sector made up nearly 5 percent of Canada’s Gross Domestic Product (GDP). Canada offers some of the best cuisine in the world, with some of the most notable contributions being made by the French and later British settlers. However, as immigration increased throughout the years, an increasing number of different nationalities, including people from Germany, Italy, Portugal, Ireland, Japan and a number of countries in Eastern Europe, just to name a few, made their way to Canada and other parts of North America, bringing with them a vast array of traditions and recipes. The 10 provinces of Canada all feature a number of unique and interesting aspects and attractions. To illustrate this, below we have profiled a few of the coolest things to do and see when visiting Canada, including a detailed description of each attraction. Known as “North America’s Crown Jewel,” Glacier National Park in British Columbia boasts more than 700 miles of maintained trails, sparkling lakes, alpine glaciers, and deep forests. One of Canada’s 41 impressive national parks, Yoho is home to surging waters, looming peaks, pounding waterfalls, glacial lakes, and gorgeous patches of pretty meadows. From glacier-clad peaks along the Continental Divide to the semi-arid grasslands of the Rocky Mountain Trench, where cactus grows, Kootenay National Park is noted for its diversity of landscapes, ecology, and climate. A drive along the summit parkway in Mt. Revelstoke National Park will take you through a variety of geographical zones. Visitors to the park can spend one day experiencing the dense growth of the giant cedar and pine forests, and the next traveling through miles of alpine meadows and tundra. Situated in an ideal spot overlooking the beautiful Kootenay Lake in British Columbia, Ainsworth Hot Springs is a must-visit for anyone visiting this gorgeous province. Guests to this site can experience the unique horseshoe shaped cave, where the darkness, mineral deposits and humidity combine for a unique hot springs experience. In addition to the hot springs pool and caves, this attraction also offers first-class accommodations, a trendy lounge and superb dining; there is also an excellent gift shop on the premises. Guests to Crawford Bay should definitely take some time to visit the impressive gathering of artisan studios located there, where they can watch craftsman such as broom makers, glass blowers, and blacksmiths ply their trade. Located in the province of Ontario, and Celebrating its 103rd birthday this year (2017), the multi-disciplinary Royal Ontario Museum is Canada’s largest museum of natural history and one of the largest museums in all of North America. The “Musie Royal de l’Ontario,” as it is known in French, is a majestic museum of art, natural history and world culture, an attraction that draws over one million visitors each year from around the world, the second-largest draw for a Canadian art museum after the famed Montreal Museum of Fine Arts. The Royal Ontario Museum is situated north of Queens Park, in the University of Toronto district, and the subway station in front of the facility also bears its regal name. The Royal Ontario Museum was initially established in the spring of 1912 and it opened officially to the public on March 19, 2015. Today, the museum is Canada’s largest field-research institution, with research and conservation efforts that span the globe. The museum is loved throughout Canada and beyond for its six-million + display items, forty galleries and the museum’s diverse collections of world culture and natural history, all of which have contributed greatly to the museum’s international reputation. The Royal Ontario Museum boasts noteworthy collections of dinosaur fossils, minerals and meteorites; Near Eastern and African art; the art of East Asia; European history; and Canadian history. It houses the world’s largest and most significant collection of fossils from the Burgess Shale, with more than 150,000 specimens. The Royal Ontario Museum additionally displays a wide collection design and fine arts, which is very popular among visitors—a collection containing clothing, and interior and product design pieces, particularly those composed used Art Deco. The Royal Ontario Museum is simply a can’t-miss attraction every time you visit the eastern part of Canada, not just for its amazing permanent collections and exhibits, but for the many temporary displays featuring items from around the world. Also located in the province of Ontario, Toronto’s iconic and very useful CN Tower, a marvel of 1970s engineering, resembles a giant concrete hypodermic needle. Its function as a communications tower, however, takes a backseat to its relevance as a tourist attraction, as riding those glass elevators up the highest freestanding structure in the world (553m) is one of those things you just have to do in this life. Defining the Toronto skyline with its majestic size, Canada’s National Tower celebrates a remarkable legacy as an iconic landmark, one of the world’s top tourist destinations and Canada’s most celebrated and oft-visited site. An architectural wonder and an internationally acclaimed entertainment and dining destination, the CN Tower is an emblematic symbol of Canadian achievement and just one example of the awe-inspiring experiences to be had when visiting Canada, Ontario and the city of Toronto. Owned and operated by the federal crown corporation, Canada Lands Company, the CN Tower is visited by over 1.5 million people each year—visitors who enjoy breathtaking views as well as everything else the CN Tower has to offer, including a rocket-like ride to the top of the structure aboard the world’s No. 1 Elevator Ride. The Tower’s glass fronted elevators also feature glass floor panels, a feature that truly adds to the excitement of this ride—a ride that spans a mere 58 seconds from the bottom floor to the top. Visitors to the CN Tower will be treated to spectacular views of the large Toronto metropolis. These breathtaking views are achieved from the structure’s four observation areas, which include the Look-Out Tower, the world famous (and world’s first) Glass Floor Elevator boasting a view 1,122 feet straight down to the ground, the outdoor Sky Terrace, and the Sky Pod, the highest of them all measuring some 447 meters. The Edge Walk at the CN Tower is also a crowd favorite. Open seasonally from April through November, the Edge Walk is the most exhilarating and extreme attraction in the Tower’s history and the world’s highest outdoor walk on a building. The spectacular architectural illumination of the CN Tower, which includes a light show at the top of every hour, begins at dusk each night and continues until after midnight. 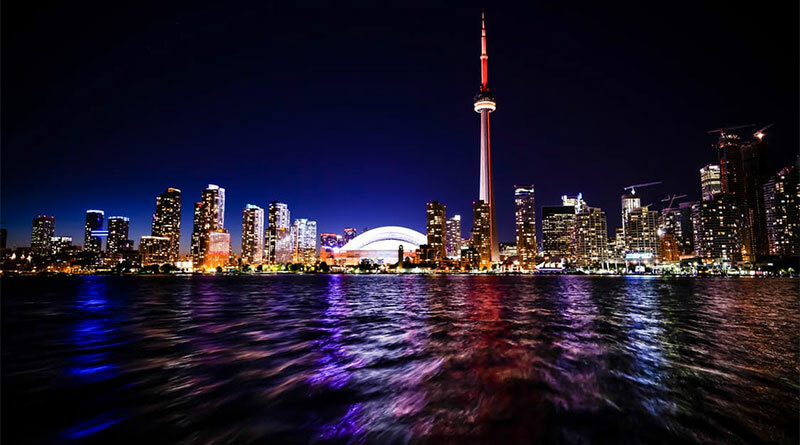 Three tasty and satisfying restaurants occupy the CN Tower, including the revolving and award-winning 360 Restaurant, the upscale bistro known as the Horizons, and the casual fare of Le Café, a diner-style restaurant with a variety of delectable snacks. Other Attractions include a state of the art theatre, the Kid Zone play area and 10,000 square feet of unique Canadian artisan souvenir shopping in the Gift Shop. Visual displays throughout the building share many fascinating stories about the CN Tower, which hosts over 500 events each year, ranging from receptions and dinners to product launches and themed events for 2 to 2000 people. Located in the celebrated city of Montreal, in the mostly-French-speaking province of Quebec, the Montreal Botanical Gardens (Jardin Botanique Montreal), offers a breathtaking view of some of the most gorgeous flora the province and country have to offer. Thanks to 10 large greenhouses, each of which is tailored to a specific theme or motif, the 185-acre Montreal Botanical Gardens is home to more than 22,000 species of plants, flowers and trees. This superb Quebec attraction offers a scenic year-round respite from the hustle and bustle of Montreal’s downtown core, and a relaxing and almost therapeutic experience that shouldn’t be missed. Guests of the Montreal Botanical Gardens can spend some time lazily strolling through the tranquil bonsai trees in the Japanese Zen garden or become a bit more familiar with the principles of yin and yang in the Chinese Garden, which showcases plant designs from the 14th to 17th century Ming Dynasty. The outdoor gardens here include a colorful rose garden and a stunning alpine garden, and if you happen to be visiting with your kids on a family trip, be sure to take in the ever-popular toxic plant garden, an educational experience to say the least. Located in northern Plateau Mont-Royal in Parc Maisonneuve (accessible via the Green Line’s Station Pie-IX métro station), the Montreal Botanical Gardens open every day at 9 AM and stay open until 5 or 8 PM, depending on the time of year. The entry fee for this attraction varies by age; an adult ticket costs CA$19.75 (about $15 American), while seniors and children 12 and under are admitted at a discounted rate. Located in the province of Alberta in the region of Bridgeland, Calgary, the Calgary Zoo is a wonderful way to spend the day when visiting this part of Canada. The zoo is situated just east of the city’s downtown and adjacent to the Inglewood and East Village neighborhoods. It is accessible via Calgary’s C-Train light rail system, by car via Memorial Drive, and by bicycle and footpath via the Bow River pathway. A large portion of the zoo is located on St. George’s Island in the Bow River. The Calgary Zoo is home to almost 800 animals, excluding individual fish and insects, and 130 different species. The 120-acre zoo is organized into six distinct zones that reflect different geographies and climates: Destination Africa, Canadian Wilds, Penguin Plunge, Dorothy Harvie Botanical Gardens and ENMAX Conservatory, Eurasia, and Prehistoric Park. The zoo is open every day except for Christmas Day. Some of the highlights of the zoo include triceratops grazing among the bushes in the Prehistoric Park, and the fearsome T-Rex’s banana-sized teeth ready to tear into his next meal. This March (2017), The Calgary Zoo is bringing back its show Dinosaurs Alive, an animatronic dinosaur exhibit last shown in 2010. Following the refurbishment of the Prehistoric Park, the zoo will introduce 17 dinosaur models into the park to add to the current collection. These realistic, fleshy models have special engineering to help them move in a true fashion. All of the creatures vocalize and some can even be controlled through the touch of a button by a curious visitor.